Empanada Gallega - A Recipe and Story of Galicia's famed dish. I hesitate to translate it, as the original essence is much more romantic than its English equivalent – “both falling in love and kneading (as in bread), require time,” which begs the response, “no kidding…”. But this subtle call for patience in today’s I-don’t-have-time society, is a nice reminder to appreciate the small things in life. Small things that brought enormous excitement in the village in Lugo where Fresita grew up – a village of just six houses. The day bread was made for example, occurring just twice per month. Two weeks may seem like a long wait for fresh bread, but the durability of Galicia’s hardy country bread, makes the rapid deterioration of today’s industrial baguettes all the more depressing. Why the long wait? Because just one of those six homes had a wood-burning oven big enough to bake bread. So a rotation was established, and each family had their turn, roughly twice per month. As opportunities were never wasted, the chance to bake bread meant the chance to make an empanada gallega, one of Galicia’s famed regional dishes that has always evoked great pride. What is an Empanada Gallega? The term empanada comes from the verb empanar, meaning to wrap or coat in pan (bread). This Galician specialty is northwest Spain’s contribution to the numerous examples of bread as a casing: the Turkish dönner kebab/Arabic shawarma/Greek giro, the Italian calzone, the Cornish Pasty from southwest Britain, etc. Galicians take special pride in their version however, as the recipe has formed an essential part of local cuisine dating back to at least the 12th century, when the empanada was immortalized in the monumental Pórtico da Gloria facade of Santigo de Compostela’s Cathedral. And what better a recipe for the millions of Camino pilgrims who made their way to and from Santiago over the centuries. In an age where cleanliness was nearly impossible to maintain – especially when on the go! – the empanada’s ability to shelter more valuable, calorie-filled ingredients, was surely one of its greatest assets. Generations of Galician sailors were keen on the empanada for the same reasons, making it a staple food on their long voyages. Then in the late 18th century, the empanada made its way to the New World in mass, when the Spanish crown lifted restrictions on who could settle in Spain’s overseas territories. As one of Spain’s poorest regions, Galicia saw large-scale emigration, so much so, that even today in countries like Argentina, the colloquial word for Spaniard is Gallego (Galician), regardless of the Spaniard’s origin. In all likelihood, a variation of the empanada already existed in Latin America, but the influx of real Gallegos cemented what is today an integral part of many South American cuisines. 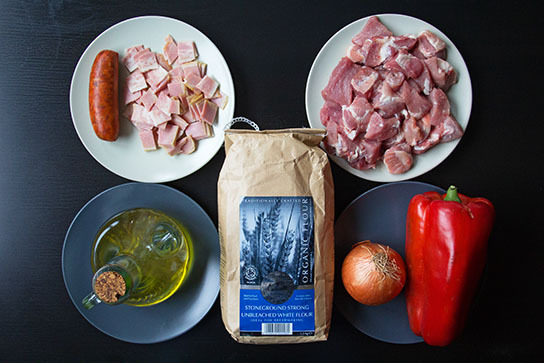 The ingredients that fill the empanada gallega vary from one Galician province to the next, with seasonal changes being common as well. The biggest division however, is found between Galicia’s coastal areas where seafood and shellfish prevail, versus the pork-dominated rural interior where Fresita is from. The empanada recipe Fresita knew as a child was loaded with chorizo sausage, onions, and a heavy dose of tocino – stomach-filling pork fat. The aroma of these three ingredients fusing together in the oven was enough to bring all seven siblings storming into the neighbor’s house. And while the bread may have lasted two weeks, the empanada barely lasted two days. Once you try it, you’ll see why. Adapted from Fresita’s non-existing recipe book. Serves 4-5 as a main dish. Fresita’s recipe below reflects the empanadas of her childhood, although she’s replaced the tocino with lean pork meat and added bacon to boot! enough water to be able to knead the dough. I had trouble pinning Fresita down on the exact amount. Roughly calculate around 350g of water. 1) To make the dough, mix together the dry ingredients first, followed by the water and the olive oil. Stir the ingredients together with a mixing spoon until solid enough to be able to transfer to a cutting board. Knead the dough with wet hands for several minutes, until all the ingredients are evenly integrated. The dough should be soft and tacky. If not, add more flour or water as needed. Once the dough is too firm to knead any further, let it rest on a lightly floured surface for 5 minutes, while you prepare a clean, lightly oiled bowl. 2) The dough will have relaxed after its rest (we all knead a good rest! ), and now you can knead the dough once again for 3-4 more minutes to strengthen the gluten. The dough should feel strong, yet supple and tacky. Form the dough into a ball and place it in the prepared bowl, rolling to coat with olive oil. Cover with plastic wrap and let rise at room temperature until it’s about 1.5 times its original size. 3) Once the dough has risen, you can either punch it down and let it rise again (which takes less time the 2nd go around and brings out more flavor), or if you’re one of those impatient types who can’t wait for a 2nd rise – let alone 2 weeks for fresh bread – you can separate the dough in two equal pieces, and begin flattening out the first piece with a rolling pin. Fresita uses a baking sheet of roughly 34cm x 40cm (around 13 inches x 16 inches) and is able to fill almost the entire sheet with the bottom half of the empanada dough. 5) Sprinkle the pork meat over the bottom layer of dough, followed by the chorizo, bacon, onions and bell pepper. Make sure to leave a small space between the ingredients and the outer edge of the dough. Sprinkle a dash of salt over the mixture, as well as a heavy splash of extra virgin olive oil. 6) Roll out the other half of empanada dough that you’ll use to cover the ingredients. Leave the top half slightly shorter than the bottom half, which will allow you to curl up the bottom half over the top and seal the empanada. Once sealed, use a fork to push the two borders together in order to “lock” them. 7) Place the empanada in the bottom rack once the oven has reached 180 degrees C, and cook for roughly 45 minutes to an hour, or until the crust is golden brown. 8) To serve the empanada gallega, you can either chop it into bite size tapas, or slice it into larger chunks to be eaten as a meal on its own, which is what Fresita prefers. Let me know in the comments section how it turned out!